Through a partnership with Share Our Strength, Dare to Care offers Cooking Matters, a nutrition outreach program that empowers families with the skills, knowledge and confidence to prepare healthy and affordable meals. Dare to Care offers different courses for adults, families, parents and kids, teens and children. 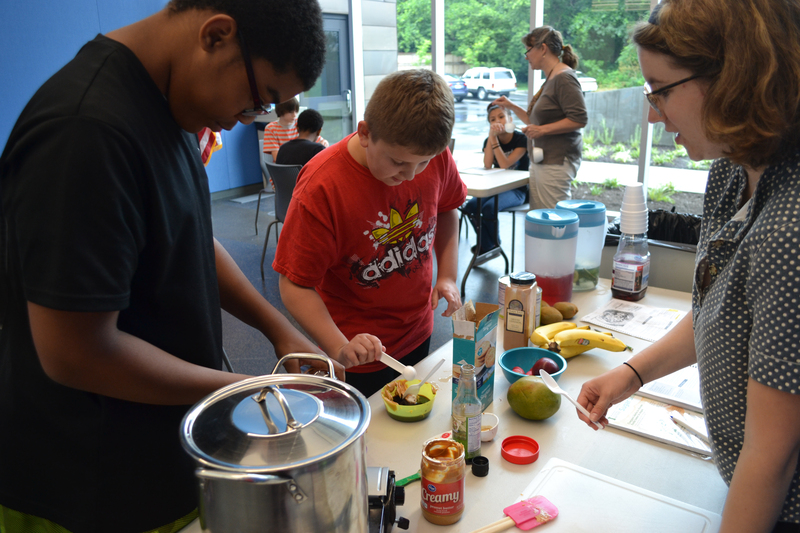 Cooking Matters requires both nutrition and culinary volunteers to teach classes. Nutrition volunteers should have a background in nutrition or home economics, and will implement prepared lessons using instructional materials. Dare to Care provides all materials and groceries. A professional background in culinary and/or nutrition is encouraged, but not required. Training will be provided. Volunteers will teach food preparation and food safety. Recipes, activities and handouts are provided. Both nutrition and culinary volunteers commit to teaching a 2-hour class, once a week for six weeks. To volunteer with Cooking Matters, please contact Kimberly Gravley, Director of Nutrition Education, at 502.736.9418 or return the completed Cooking Matters Volunteer Application. For Cooking Matters updates and volunteer resources, please visit the Cooking Matters Blog. To learn more about Share Our Strength and Cooking Matters nationally, please follow this link.